While working in Oman in 2012, Sukhdev Singh, a carpenter from the Indian Punjab, had the most unexpected encounter. Sent to Masirah island for about ten days to repair woodwork in the restricted area of the Masirah Air Force Base, he was approached by an elderly man. Recognising the Sikh turban that Singh wore, the man, wearing a Muslim skull cap, approached Singh secretly and spoke to him in Punjabi. He asked Sukhdev which village he was from. On hearing the answer, Dugri village in Ropar district, the man introduced himself as Sepoy Jaspal Singh from 15 Punjab, also from Ropar. His in-laws were from Dugri itself; his father-in-law’s name was Waryam Singh. He said he had been captured by Pakistani troops along with four other 15 Punjab personnel during the 1971 war, on 4 Dec during the Hussainiwala battle in Firozpur district, Indian Punjab, at the border. Other prisoners from 15 Punjab included IC-12712 Major S. P.S. Waraich, IC-14590 Major Kanwaljit Singh Sandhu, No 2461830 Sepoy Daler Singh and No 2459087 Sepoy Jagir Singh. Taken to Pakistan and imprisoned there initially, Jaspal Singh said he was shipped to Oman some six years later. He told Sukhdev that two other Indian prisoners had been brought there with him but shifted elsewhere a few years earlier. At least one other person from 15 Punjab, a man from Moga, Indian Punjab, was also in Masirah, but Sukhdev did not meet him or ask where he was. Jaspal told Sukhdev Singh not to talk about this as it may get Sukhdev into trouble. However, after his return to India, in September 2012 he talked about his experiences with Dr Simmi Waraich, daughter of Major S. P. S. Waraich, and H. S. Gill whose brother 4657- F(P) Wing Commander Hersern Singh Gill of 47 IAF Squadron also went missing in the 1971 war. Lt Col (retd.) Habib Ahmed, SJ, who commanded 41 Baloch, the Pakistani unit fighting 15 Punjab, writes in his book Battle of Hussainiwala and Qaiser e Hind: The 1971 War (Oxford University Press, Pakistan, 2014) that his unit “got hold of an enemy Sikh officer of the rank of Major, named S P S Warraich. He was immediately taken prisoner by Havildar Khizar but, unfortunately, a machine gun burst from the direction of the railway bandh downed the Major”. When asked about the Major’s fate by an officer from Pakistan Army’s Military Operations Directorate, following a query by then Indian Army chief Gen S.H.F.J. Manekshaw, Lt Col Ahmad says he told him that the officer was shot in a hail of Indian gunfire. However, this account is contradicted by Col. (retd.) Parvez Iqbal, Adjutant of 41 Baloch at the time. Iqbal, who maintained a war diary in the unit, has been in contact with Dr Simmi Waraich and says that no Indian prisoners of war (POWs) were captured. In any case Pakistan has not returned his ashes nor has there been any DNA testing to establish that Maj. Waraich was killed. Sukhdev Singh told Simmi Waraich and H. S. Gill that the air base in Masirah island was near a petrol pump. ‘Meeting Jaspal was a chance encounter’, he said, as not everyone could go inside the restricted area. Sukhdev had been sent by a local contractor. He said that Jaspal Singh was around 70 years old and seemed to be good health. It is important to note that Jaspal Singh, whom Indian authorities had presumed dead in the war, was never counted among the ‘Forgotten 54” Indian prisoners of war that many of us have been calling to release on humanitarian grounds. Learning from news reports that he was alive in Oman only increased the family’s anguish. They have since approached the Ex-Servicemen Grievances Cell, Punjab, India and sent an application to the then Army Chief Gen Bikram Singh. They also approached Shiromani Akali Dal leader Balwant Singh Ramoowalia for help. None of these appeals have borne any fruit. 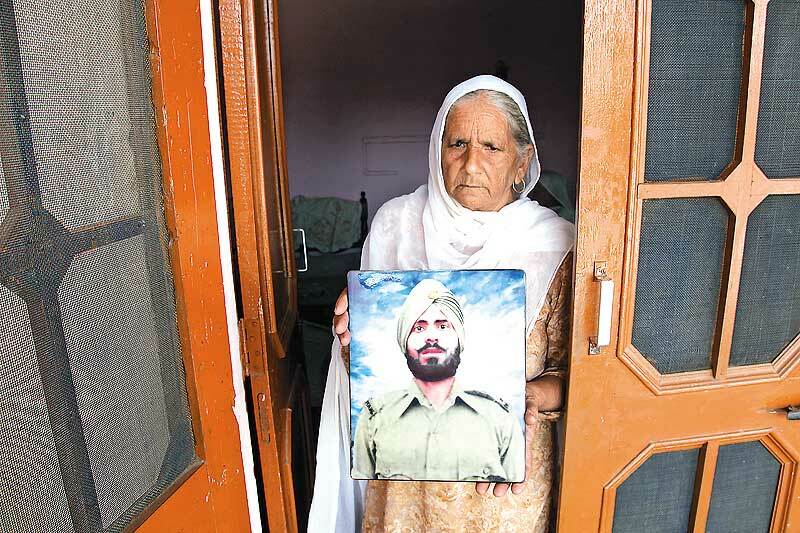 Jaspal’s wife Baljit Kaur, about 65 years old in 2012, said she often communicated with the wives of other missing soldiers but had never before heard any reports about her husband being alive. “We presumed he was dead and accepted this as fate,” she told the Ex-Servicemen Grievances Cell, Punjab and the local media. Jaspal’s son Kamaljit Singh was three years old in 1971 when his father went missing. “I do not remember much about my father. The news was so unexpected. Since then we have approached all authorities like the Ex-Servicemen Cell, Shiromani Akali Dal Leaders, former Army Chief General Bikram Singh, and Indian print and electronic media seeking help to get in touch with my father. These have not borne any fruit till now,” he said. Anita Sharma, Managing Editor India TV who has been in touch with me about the issue of Indian POWs in Pakistan, got a Chandigarh police sub-inspector who is an expert at sketching the faces of missing persons based on physical descriptions. Based on Sukhdev Singh’s description of Sepoy Jaspal Singh, the police artist drew the picture displayed with this article. I also sent several emails to the Indian Naval Attache in Oman but got the sarkari (bureaucratic) reply that the Oman government had responded to India’s queries saying that no such individual was in their custody anywhere in Oman. While Sukhdev Singh may well have meet Sepoy Jaspal Singh there as he said, Dr Simmi Waraich says that it is unfortunate that the news was leaked to the press. The Indian prisoner or prisoners may have been moved elsewhere after information about this meeting came in public domain. Why would Pakistan have sent these men to a prison in Oman? We can only speculate that if this was the case, it was to keep them isolated and minimise the chances of their escape by locating them in a strange country far from India. Shivalik Bakshi, nephew of Major Kamal Bakshi of 5 Sikh captured in the Chamb sector in 1971, believes that many or all the ‘Forgotten 54” are in similar secret detention places across the Middle East. Besides Oman, Pakistan has good connections with Jordan and other countries in the Middle East. Gen. Zia ul Haq helped young King Abdullah fight off challengers to his rule and Jordan even sent Starfighter aircraft to Pakistan during the 1971 war. As stated earlier, because India had presumed him dead, Jaspal Singh is not included in the original list of 54 Indian POWs believed to be incarcerated in Pakistani jails since the 1971 war. There may be other such prisoners held in unknown and unsuspected places. There has been little movement in this case since news of Sepoy Jaspal Singh’s whereabouts came out and the sketch was made. Nothing has come of the petition seeking his release filed by a local lawyer Hari Singh Nagra, heard by a division bench of the Punjab and Haryana High Court headed by Chief Justice A. K. Sikri. I earnestly request the Indian, Pakistani and international communities to release all military and civilian prisoners held in their respective countries to end this unfortunate and grave human tragedy. The mortal remains of those who died in the custody should be handed over to their families so they may take care of the last rites, property transfer and pensionary benefits. Those of us working on these issues must keep on raising a voice. But how does one convince our governments to do something about this humanitarian issue?